Looking for a safe, effective way to heal the aches, pains and potential injuries that accompany an athletic lifestyle? Acupuncture may be an avenue to explore. Many pro athletes, sports clubs and sporting events utilize acupuncture to enhance athletic performance and to increase recovery times. In fact, it's even becoming more common for organizations to have a licensed acupuncturist on staff. Acupuncturist Andrea Allerton of Modus Acupuncture offers her services at the US Open of Surfing each year. She says, "The surfers tend to have a lot of shoulder, back and hip challenges and seek treatment to reduce swelling, increase flexibility, and manage pain." Acupuncture is a form of Chinese medicine, which has been a common practice around the world for over 2,500 years. Acupuncture was widely used and publicized in the 2008 Olympic games in China as a respected and effective method for injury prevention, treatment and pain relief. The US National Institutes of Health and the World Health Organization promote acupuncture as "A safe and effective tool in managing pain and injury while supporting optimal wellness." What to Expect in an Acupuncture Session? During an acupuncture session, the skin is punctured by sterile, disposable, hair-thin needles that are inserted into specific areas on the body known as acupuncture points. Each point runs along an energetic pathway, or a meridian, and has a specific function to effect physiological change in the body. 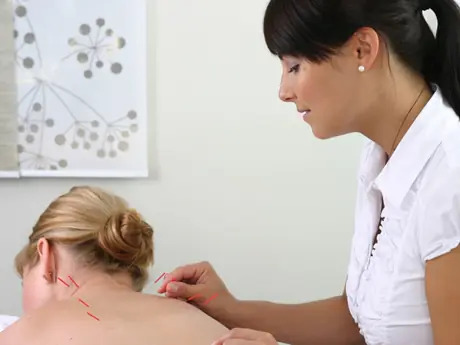 The human body has over 2,000 acupuncture points connected through the meridians. The Chinese discovered and mapped out these points on the body thousands of years ago. The acupuncture points have electrical properties that affect chemical neurotransmitters in the body. Recent electromagnetic research confirms the existence of these points and their locations. Vital energy called qi ("chi") runs a circuit through the human body by energetic pathways (meridians). Often the flow of qi is disrupted by stress, poor diet, trauma, injury or emotional distress, which creates an imbalance leading to symptoms such as pain. Pain is the body's natural way of alerting you that a disturbance to your equilibrium has occurred. Acupuncture reestablishes the flow of qi to create balance and to activate the body's innate healing ability. Western science acknowledges the ability of acupuncture to affect many of the body's systems including the neurological, endocrine, respiratory and digestive systems. How Does Acupuncture Help Athletes? Acupuncture is an effective, personalized, non-pharmaceutical and non-surgical method of therapeutic treatment. As a holistic alternative or compliment to Western medicine, it works to restore the body's natural state of balance by accessing your own ability to heal. Pain Relief: When the inserted needles stimulate the acupuncture points, the body releases endorphins, a natural painkiller. The endorphins provide rapid—often long-lasting relief—and patients usually feel the results after one treatment. Working at the source of the pain helps decrease inflammation, increases range of motion, and boosts the immune system. Taking drugs can mask the pain, exasperating the condition and creating permanent damage. Acupuncture is a medically effective alternative for pain relief without the harmful side effects. Laura Waite is a yoga teacher and certified massage therapist in Dana Point, California.